LIMA — The implementation of da Vinci robots at Lima Memorial Health System now allows hernia surgery patients to return home the same day as their surgeries, according to Dr. Noorul Khan, Lima Memorial Health System surgeon. 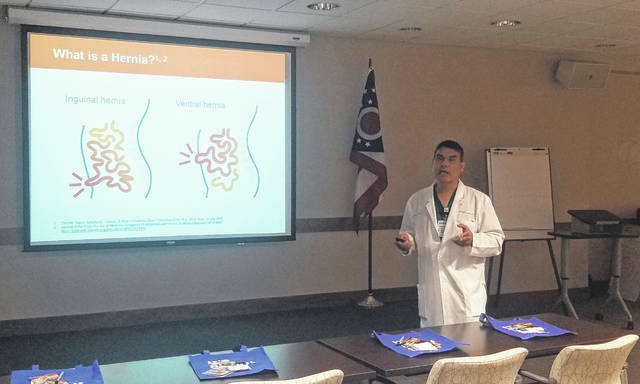 Khan and Dr. Jeremy Heffner led a hernia education presentation Tuesday at the Lima Memorial Health System Auxiliary Conference Center. The presentation focused on hernia detection and treatment. Hernias, which occur when tissues go through the abdomen or groin area, can be caused by several factors, according to Khan. The factors include any activity that increases pressure in the abdominal cavity such as frequent lifting of heavy items, pregnancy, constipation or chronic cough. Although some patients have not experienced any systems, typically patients with hernias experience bulging or pain around their abdominal area. Patients who have experienced symptoms are encouraged to contact their doctor for an examination to determine the diagnosis, according to Khan. Through technology like CT Scans, doctors can determine the exact nature of the hernia and the size of the defect. Once the hernia has been detected, patients can either choose to do nothing or undergo surgery. Patients who have hernias and decide to do nothing will risk it not closing or it increasing in size due to pressure on the abdominal area. Patients who seek a permanent fix can undergo either open surgery, laparoscopic hernia repair surgery or robotic (da Vinci) surgery. During open hernia repair, surgeons make a cut, identify the defect, repair it and put mesh underneath the area and sew it down. Laparoscopic Hernia Repair Surgery requires holes in the affected area, identifying the defect, closing the defect and reinforcing the area with mesh. The robotic-assisted hernia repair surgery uses a camera and instruments which is inserted into small designated holes in the stomach. This is the most recommend form of hernia surgery, according to Khan. Doctors can reduce the hernia size and close the defect, which Khan said is very easy and effective. Also this surgery allows doctors to detect and repair multiple hernias on either side of the body. “It allows us to get into areas and into planes and do things that up until four years ago we did not think was possible,” said Heffner.